A traditional Louisiana dish, étouffée is literally the French word for “smothered.” Freshly chopped onion, celery, and bell pepper complement a delicious blend of mushrooms and white wine in a unique tomato sauce seasoned to perfection. 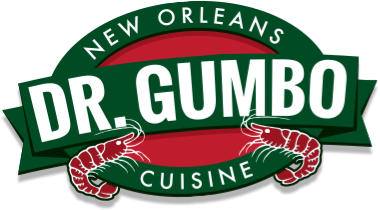 Dr. Gumbo’s Shrimp Creole is a savory combination of diced tomatoes, tender shrimp and a medley of fresh onion, bell pepper, and celery accented with lemon juice. It is served over a large bed of rice. This traditional Monday “Wash-Day” dish is served throughout New Orleans. Dr. Gumbo created a delicious version that is both creamy and flavorful. Our Black Bean Soup is a spicy version of this ethnic dish with a delightful hint of cilantro. Use this unique recipe over rice, or with sour cream, cheddar cheese, and chips.